This is the back of my 1991 class T-shirt. 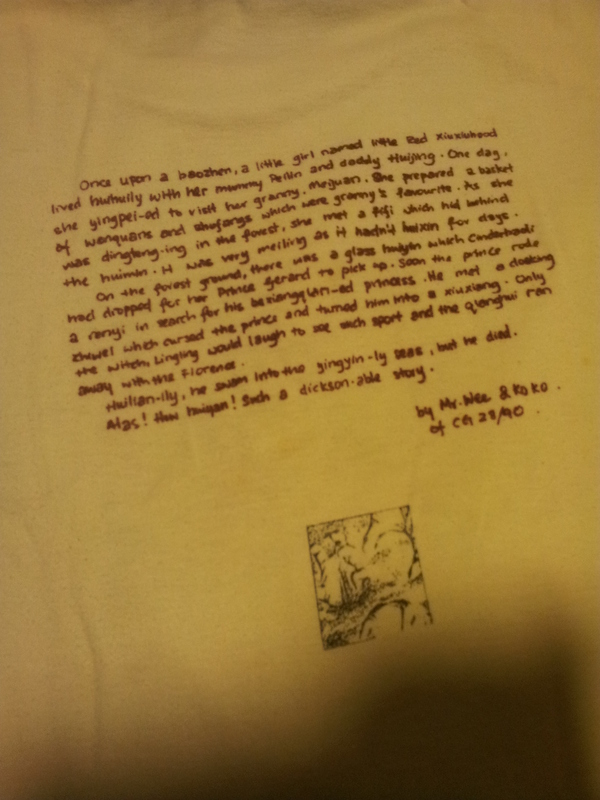 Koko did the graphics and I was to write all the classmates’ names on the back, so this was/still is my handwriting. I decided on a nonsensical story, like Jabberwocky, except that I hadn’t read Lewis Carroll nor Edward Lear back then, so I didn’t really know. On hindsight, this must have been the dawn of grammatical consciousness for me. When composing, I learnt to create adverbs, adjectives etc by manipulating morphosyntactic properties, divorcing the outcome from semantic senses. I remember being unable to create prepositions or articles. The shirt was stashed away since the end of 1991 and I didn’t see it again until 2012 before I started wearing it again, and it was only then did I find the coincidence with my linguistic career so uncanny. In 1991, I was a very uncertain lad, but some of my classmates obviously saw that I wasn’t incorrigible. My class monitress called me “Mr Wee” as a subtle and friendly strategy to make me discipline myself. I was/still am in awe of her; she was physically and intellectually my superior (probably still is, but I haven’t met her since then). I aspired to compose a philosophical treatise and aimed at being a renaissance man. The latter is still among my goals, except that I no longer think it is possible to attain it. Looking back, I think Time has wasted his efforts on me, for other than physical deterioration, I seem to continue at the same failures, though I am glad to say (channelling the late Prof Martha Cheung citing Beckett) that I think I fail better each time.